The work Marx and Keynes by Paul Mattick is not commonly known as a classic. I discovered the book during one of my visits to left-wing book shops (Rooie Rat in Utrecht, Fort van Sjakoo in Amsterdam, and Rosa in Groningen), who all have a weakness for anarchism. Mattick belongs to this category of anarchism, because on the ideological level he identifies with council communism, just like for instance the Dutchman Anton Pannekoek. Incidentally the council communism has always remained sectarian. Mattick belongs to the large group of German socialists, who during the roaring twenties and thirties wisely went into exile to the United States of America. Mattick would never again leave America, apart from incidental business trips. In spite of his intellect Mattick had not completed a university study. The remnants of the class society had been too large an obstacle. In the USA he engaged in self-tuition, that allowed him to become a political journalist and writer. His early work is characterized by an orthodox marxist conviction. He published regular analytic accounts about the conflicts of interest between labour and capital. Among his employers was the trade union International Workers of the World (IWW). After WWII the radical-left magazines in the USA were prosecuted and repressed. 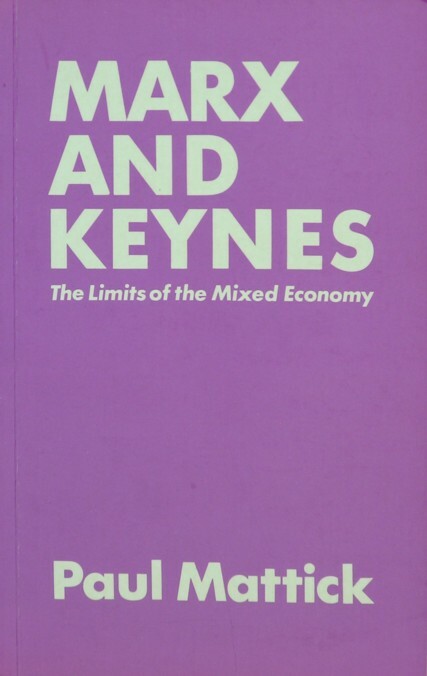 During this black episode Mattick started to study the ideas of John Maynard Keynes, that had stimulated an expansive economic policy throughout the world. Mattick tried to build a bridge between the new theory and the deep insights, that he had gained in marxism. In this way he definitely became a qualified political economist. When after 1966 the politics radicalized again, Mattick was among those, that could provide a theoretical base for the movement. In the following decade, until his death, the student activists hailed him as a popular speaker. It is the enchantment of the new: A new spring and a new sound1. In the book Marx and Keynes Mattick describes how notwithstanding the dominant neoclassical theory of the Austrian School there have been many attempts by independent macro-economic thinkers to advance the economic science. Of course this book is not the only survey of the macro-economic theory from a radical perspective. Other books are perhaps more popular, like The theory of capitalist development by Paul M. Sweezy, Studies in the labour theory of value by Ronald L. Meek, or Theories of value and distribution since Adam Smith by Maurice Dobb2. But more than any other marxist ideologist Mattick enters into the constructive dialogue. His fascination for the theory of Keynes incites him to provide for a unique contribution, more than the classics just mentioned. In his introduction Mattick acknowledges that after WWII the Keynesianism has become the new theoretical foundation of the social-democratic policy. He even views the socialist revisionists as the predecessors of Keynes. The unbridled capitalist market will seldom succeed in employing the total productive capacity. The result is waste, which is especially dramatic when it concerns the factor labour and ends in massive unemployment. The state must interfere in order to increase the investments, in cases where the market fails to do this, so that an "artificial" growth is maintained. In that case the policy parameter is the aggregate demand. According as the richness accumulates, the tendency to consume diminishes. Then raising investments is the solution, but the capital owners are sometimes unwilling to do this. For also the marginal efficiency of the capital falls. In the long run the expectations of profits deteriorate. The new capital loses its attribute as a scarce commodity. Unless the state intervenes, the economy could slide into a permanent stagnation. In a sense this Keynesian idea for the aggregate quantities is a return to the classical theory. However, there are also important differences between the two paradigms due to the recent high flight of the bank credit. Also Karl Marx foresaw a falling profit, a shortage of investments, and unemployment. The characteristic of the capitalism is the distribution of labour, which attributes an exchange value to the goods (the so-called law of value). The law of value is not directly observable in the prices, but it does appear in the aggregate added value. In the end the accumulation of capital pushes the profit rate down. The capital goods can no longer be sold, which results in instability. According to Marx the entrepreneurs are still eager to invest, but this results in overproduction. Contrary to Keynes, Marx predicts the transformation to a fundamentally new society, for according to Marx the property relations must change in order to make a purposeful use of the law of value. That cnanges the matter. In this regard Mattick follows Keynes. He states that the crises can alway be overcome. This indicates that Marx has overrated the social dynamics (class war). On the other hand there is undeniably a certain reform towards social production. But Keynes does not foresee a new dawn, and his reforms occur in a smooth way. He assumes that finally the rate of interest will have to cover only the risc and the costs of banking. There will be capital in abundance. Moreover Keynes uses another style and terminology than Marx, and he abandons the conflict theory. Keynes rejects the revolution. He has always avoided to deter the entrepreneurs and to activate the workers. In the post-war period the economy has become mixed. She is no longer a pure capitalist system, but she is renovated3. The state appears to be indispensable in order to guarantee the continuous growth. The freedom of the private market is curtailed. Thanks to the state the idle factors of production are mobilized. The situation is improved. Thus the complete socialization of the economy, that was considered during the first half of the twentieth century, is no longer supported. Not every change is an improvement. Mattick is somewhat worried that the state himself is unable to produce surplus value. All value is created in the material production only. Apparently here he follows the marxist habit to deny the value production in the service sector. It is a curious point of view. It may appeal to intuition, but on reflection spiritual needs are at least as important as physical needs. This reduces the worry of Mattick to an academic matter. Nevertheless Mattick thinks that the supposed nonproductive character brings about a ceiling for the expansion of the collective sector. Also he points to the exaggerated expectations with regard to the new policy. For it is impossible to completely eliminate the business cycles by means of state interventions. The labour theory of value is prominently present in the arguments of Mattick. Saving precedes investing. When the state invests, then it draws from the profits of the enterprises. An expanding state is accompanied by a shrinking private accumulation (the so-called crowding out). On the other hand the state investments have various advantages. In the mixed economy the state can produce an unlimited use value (utility) without an increase of the wealth due to extra exchange value. Besides the state is not obliged to make profits. And again, according to Mattick the state does not generate profits anyway. Mattick lived in a time of changes, and his book reports on those events. That colours his theoretical contemplations. The imperialism was in its declining years, and was stifled by the rising globalization. The Keynesian ideas gained terrain, and their application was successful. The equilibrium theory of the liberal Austrian School had to surrender, and lost in respect. The vision of Marx and Keynes, that stresses the economic dynamics, (again) struck root. Even the commercial sector embraced the new policy. The memories of the Great Depression were still alive and kicking. The description of this change in paradigm is a fascinating part of the book. In certain aspects Mattick turns out to be a pessimist. He acknowledges that the globalization creates a global market, but he does not expect a general rise in wealth, because the arrears of the third world would be too large. In this respect he thinks just like the Historic School and Marx, who assume a phased and accelerated progress. The progress reinforces itself. Of course Mattick sees how the national liberation wars end the colonialism. But he believes that it is replaced by the new system of neo-colonialism. Despite the clear signs Mattick can not believe, that imperialism will really disappear4. No more foresees Mattick a return of the Soviet Union towards the capitalist mode of production. Mattick was a witness of the Cold War, and at the same time became one of its victims. As an adherent of the council system he has little sympathy for the rulers in east and west. In his eyes the Leninist system of planning is not inferior to the mixed economy, but simply congenial. The difference is that a planning economy can choose to produce in an unremunerative way. Therefore he thinks that she is free of imperialist inclinations!5. In imitation of his contemporaries Mattick believes that the class of managers is on the rise6. He makes the surprising assumption that the managers have a political function, also in the private sector. Although they receive wages, their income is not related to the labour effort. Contrary to Keynes (and perhaps others like Galbraith) Mattick denies that the enterprises will eventually become socialized. The need to make profits continues to dominate over the other interests. In this respect he remains loyal to Marx. In summary: Marx and Keynes is an original description of two paradigms about the macro-economic development. Keynes has always dissociated himself from Marx, and rightly so, for they differ in their theoretical analyses. But yet both men are connected due to their conviction, that the economy is dynamic and a at the mercy of social processes. Both attach a central role to the investments, in the case of Marx preceded by saving (the accumulation). Marx created the ideological space, where Keynes could launch his own paradigm. Although Mattick can not completely free himself from the marxist orthodoxy, he is susceptible of the new Keynesian ideas. The integration of both paradigms is partly his scientific merit. Every little bit helps.